Published: My arrangement of J. S. Bach’s favorite, “My Spirit Be Joyful,” for Two Solo Instruments and Organ. 1st Solo Part instruments: Flute, Oboe, Clarinet, Trumpet, Violin, or Viola. 2nd Solo Part instruments: Flute, Oboe, Clarinet, Trumpet, Violin, or Viola. Find your desired combination HERE. 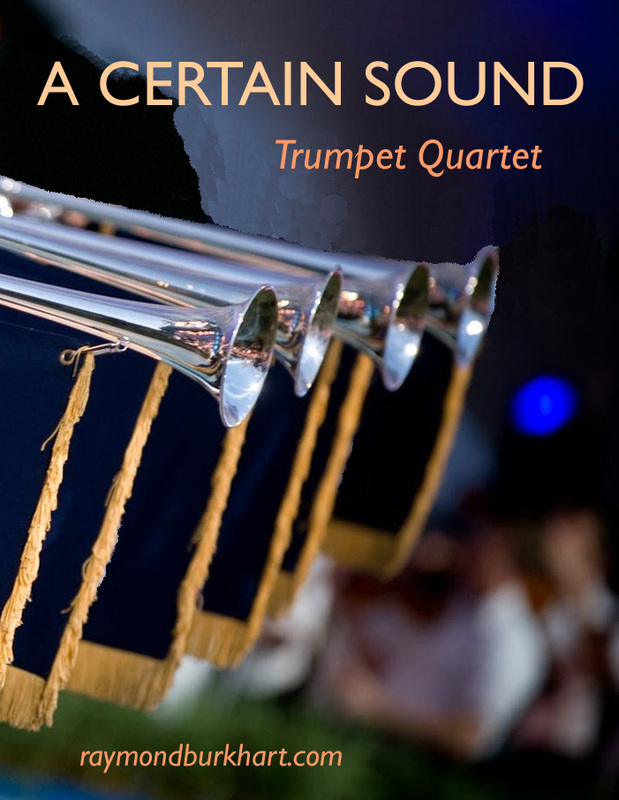 Just added to the new site, “A Certain Sound” for Trumpet Quartet. My paper, “Professional American Women’s Brass Quartets Before 1940,” is accepted for the 2019 International Women’s Brass Conference in Tempe, AZ, May 21 – 25, 2019. The Woodwinds of Santa Cecilia — Salpy Kerkonian, Sarah Beck, Michael Arnold, Rachel Berry, and Julie Feves — premiered the woodwind quintet version of my “SUITE ARCATA” on a program with music by Nino Rota and Darius Milhaud. They also performed the woodwind quintet version of my “Toot” as an encore. 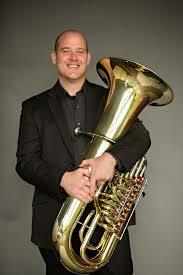 Premiered: my new HALF DOME in its version for Euphonium/Tuba Quartet. 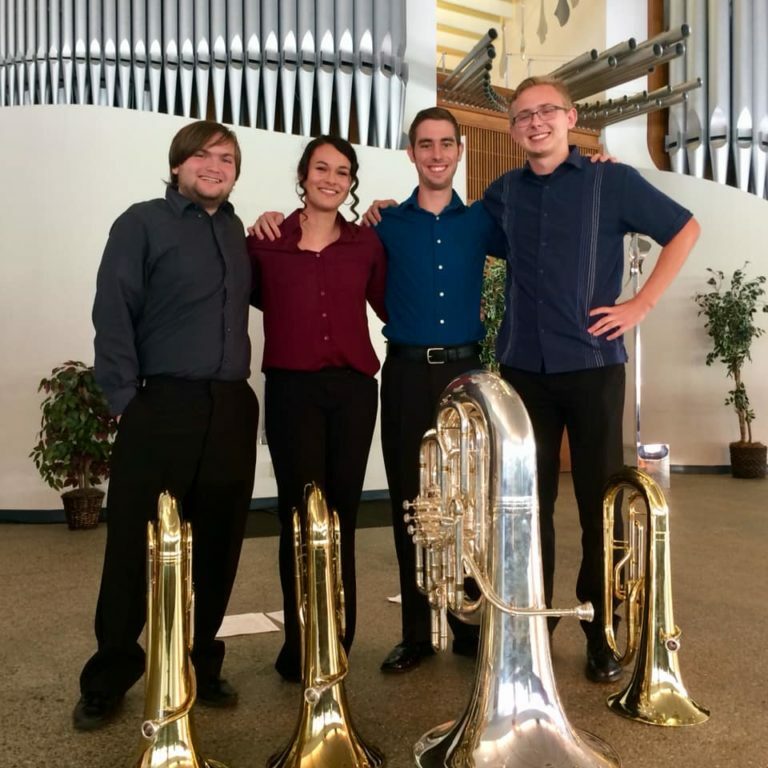 By the Euphonium/Tuba Quartet at Concordia University Irvine, David Holben, Director. Dr. Ben Pierce, Professor of Tuba and University of Arkansas, performs my ELEGY for Tuba and Piano in recitals throughout the Midwest. 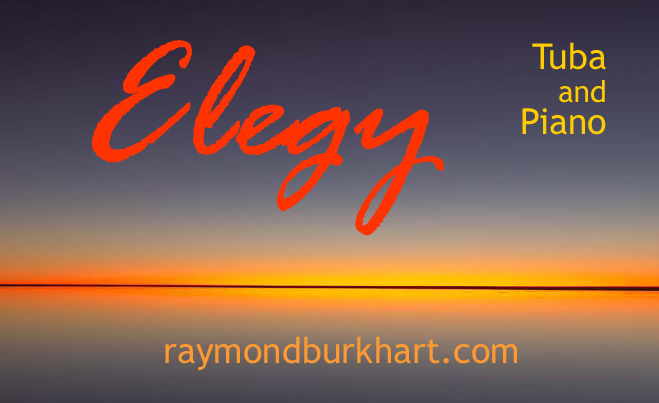 ELEGY is available for other solo instruments (violin, cello, flute, oboe, bassoon, & bass trombone), and the piano reduction was made from the string orchestra accompaniment. Listen to a “live” recording here. 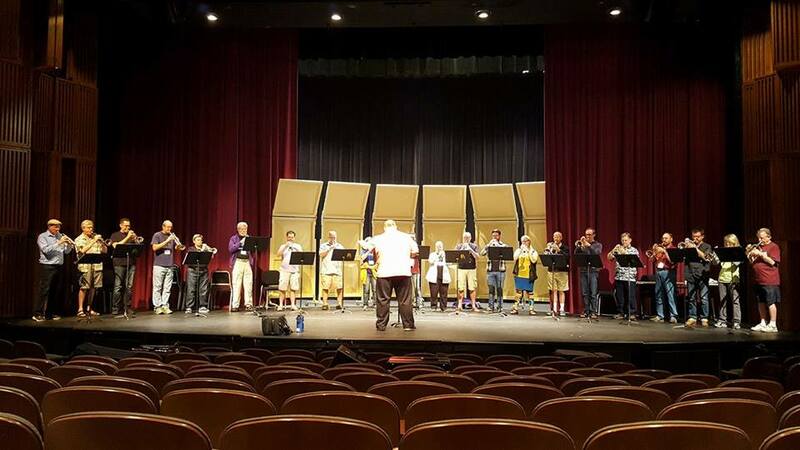 Performed: my new HALF DOME for four-part Trumpet Ensemble by the mass trumpet ensemble at the Humboldt State University Brass Chamber Music Workshop in Arcata, CA. Premiered: my new SUN DANCE, for Four Harps, by LA Harptette at the University of Redlands at the 2018 annual conference of the American Harp Society. 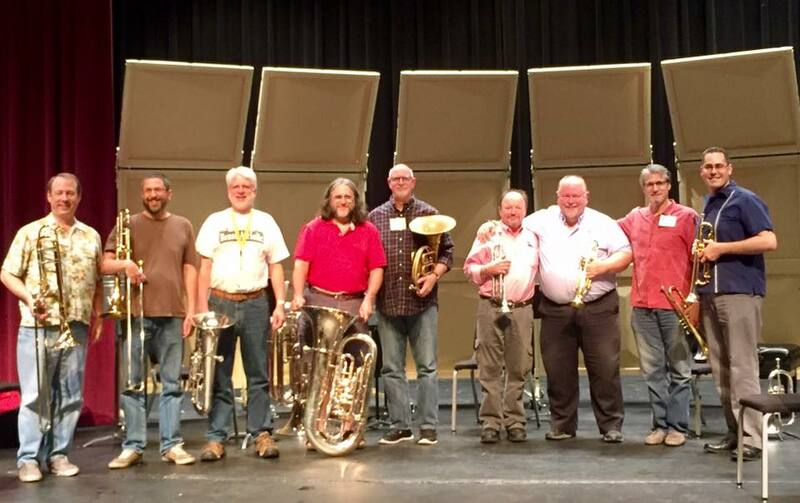 Premiered: my new HALF DOME, for four-part Trumpet Ensemble, by Ryan Anthony and the trumpet stars of the CancerBlows concert which opened the 2018 International Trumpet Guild conference in San Antonio, TX. "Raymond Burkhart’s Half Dome Fanfare (World Premiere) dazzled the audience with virtuoso acrobatics and sweeping melodic gestures." 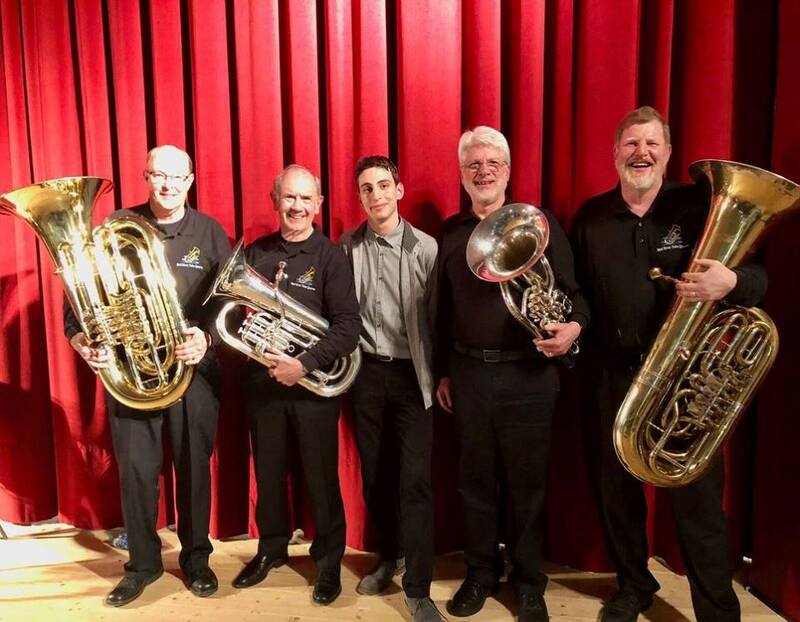 Premiered: my new IN THE EARLY MORNING, for Euph/Tuba Quartet with optional percussion, by the Mad River Tuba Quartet in Staffolo, Italy. 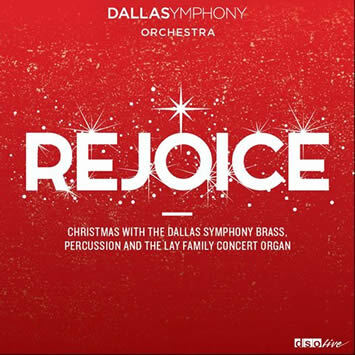 Third year conducting Horns-A-Plenty Christmas Los Angles, including some of my Christmas arrangements for Eight Horns. 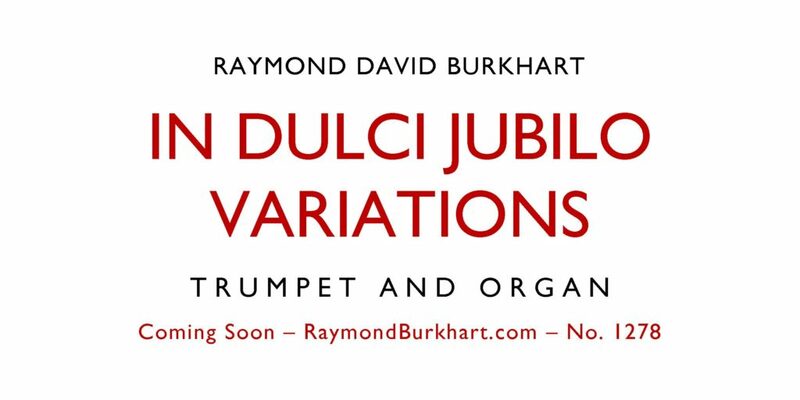 My new IN DULCI JUBILO VARIATIONS for Trumpet and Organ is composed and premiered. Also soon to be published for Trombone and Organ and Tuba and Organ. Coached again at the Humboldt State University Brass Chamber Music Workshop, 36 years after I first attended! A little trumpet ensemble action. And … the staff ensemble. YOSEMITE FANFARE, my new four-part work for trumpet ensemble, is performed and recorded at Ryan Anthony’s Cancer Blows 2017. 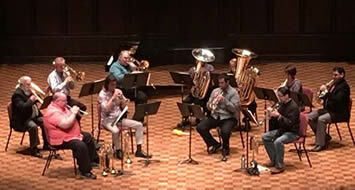 Pomona College Brass Extravaganza features several of my compositions and arrangements for Ten Brass, including “Three Renaissance Carols Reborn,” “Rejoice,” John Stanley’s “Trumpet Voluntary,” G. Gabrieli’s “Canzon Septimi Toni No. 2,” and others. 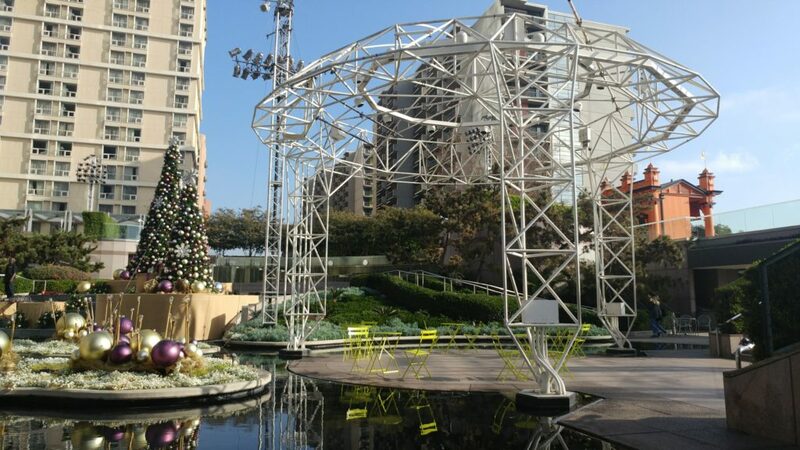 Delighted again to conduct Los Angeles’ own Horns-A-Plenty Christmas in downtown L.A., including my horn octet settings of The First Noel, The Coventry Carol, and O Come All Ye Faithful. 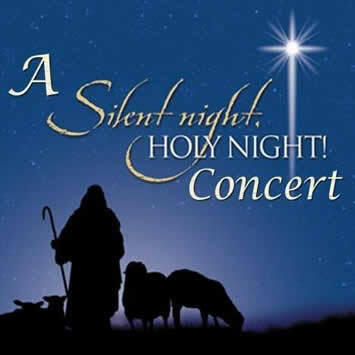 My arrangement of “The Coventry Carol” for soprano and orchestra is performed in La Canada, California. 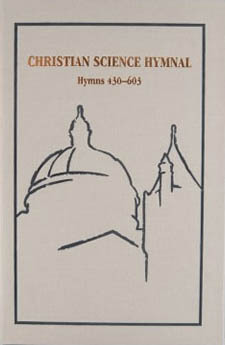 Versions also available for SATB/orchestra and for orchestra alone. 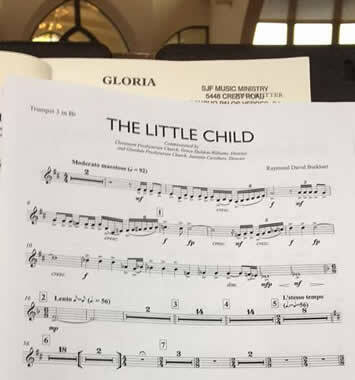 My Christmas cantata, “The Little Child,” is performed in Palos Verdes, California with John Rutter’s Gloria. Same basic instrumentation, and a great pairing that every choral conductor should try! 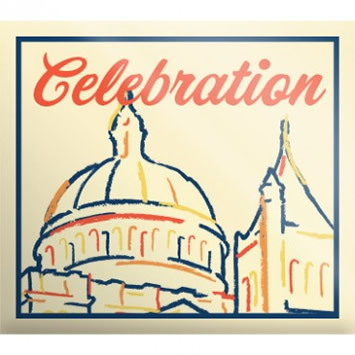 Two of my new hymns recorded on “Celebration,” the new double-CD of new Christian Science hymns. 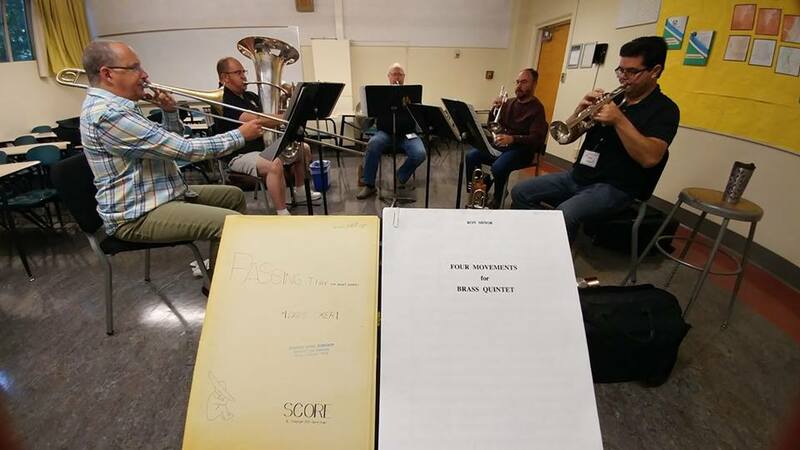 Cal State Summer Arts “International Brass Quintet Composition” program features the Principal Brass of the New York Philharmonic Orchestra and composition faculty Eric Ewazen, Tony Plog, and Ray Burkhart, including a performance of my RICORDI D’ITALIA. 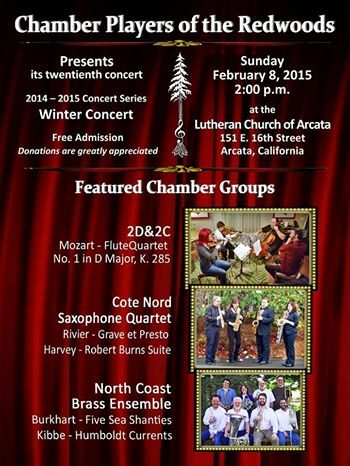 Calico Winds gives two recitals featuring my compositions, including Watercolor Menagerie and Suite Arcata. 2016 International Trumpet Guild conference offers “The Music of Raymond Burkhart,” a program of my brass quintet music and my Double Concerto for Flutist, Trumpeter, and Orchestra in a version with piano accompaniment. 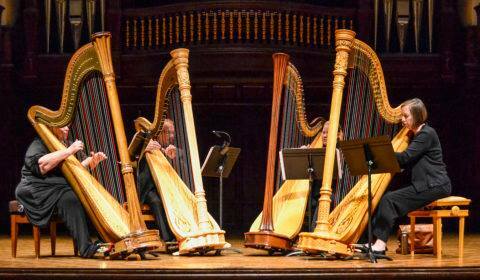 Featured artists were Malcolm and Stephanie McNab and the United States Navy Academy Brass Quintet. 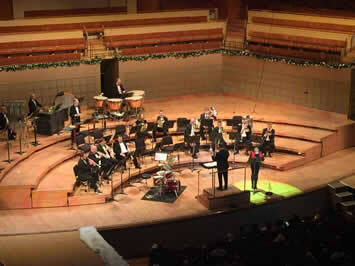 My “Sophie’s Waltz” played by the Soka University Concert Band in Aliso Viejo, California, Alfred Lang, conducting. 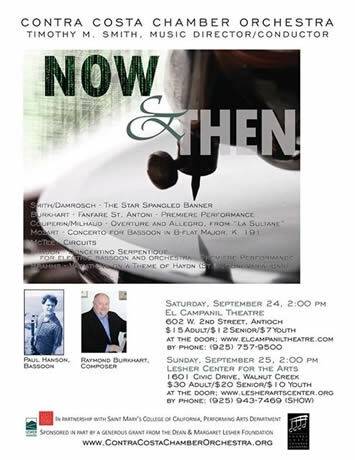 Ray conducts Pasadena’s Crown City Symphony in a program including the premiere of his Elegy for Violin and String Orchestra, Mendelssohn’s Violin Concerto, and Dvorak’s Symphony No. 8. Paul Stein of the Los Angeles Philharmonic Orchestra soloed. 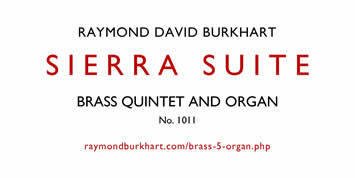 Premiere Press publishes Ray’s Complete Brass Quintets, Vol. I: Compositions. 21 original works. 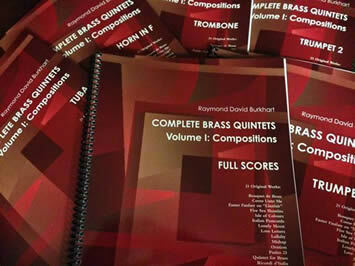 Books for Full Score, Trumpet 1, Trumpet 2, Horn, Trombone, and Tuba. 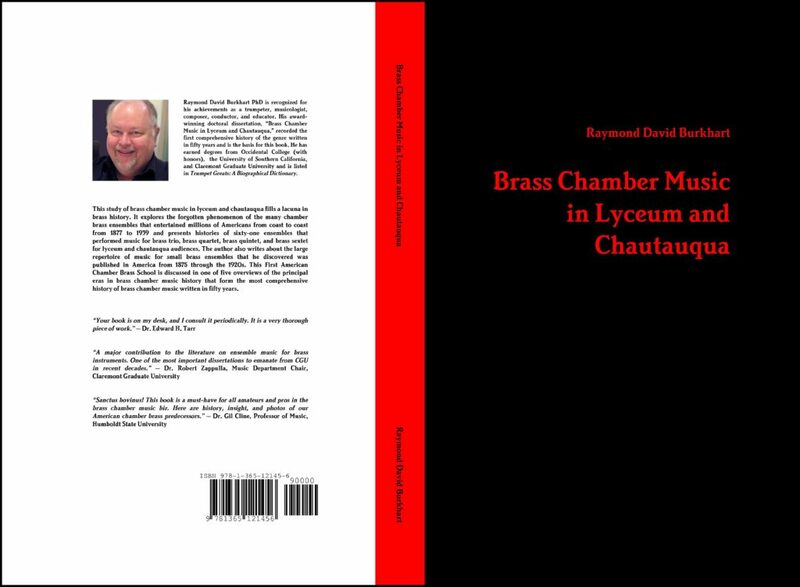 Premiere Press publishes my book, Brass Chamber Music in Lyceum and Chautauqua. 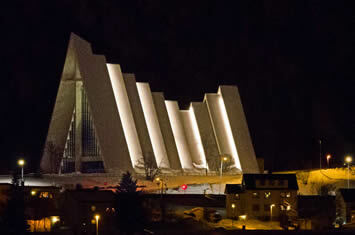 Two of my works for trumpet quartet performed in Tromsø, Norway at the Ishavskatedral (Ice Ocean Cathedral) by the University of Tromsø trumpet studio. My version of The First Noel for eight-part trombone choir performed by nearly 40 trombonists of the Moravian Trombone Choir of Downey, California for their 50th Anniversary concert. 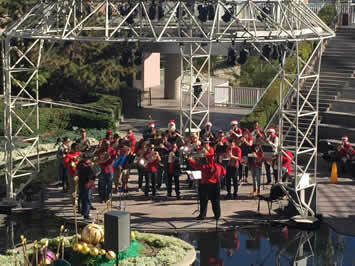 Ray conducts 40 horns at Horns-A-Plenty Christmas Los Angeles at California Plaza in downtown LA, including my horn octet settings of The First Noel and The Coventry Carol. 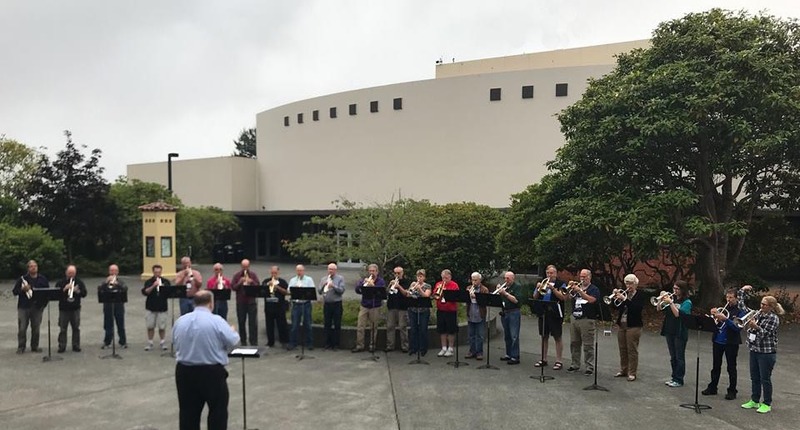 The Humboldt Bay Brass Band perform’s my “Ozark Point” in Arcata, California. 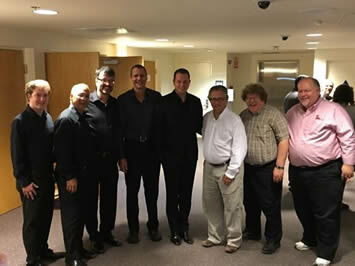 Ray’s SUITE ARCATA premiered at Pomona College in Claremont, CA. 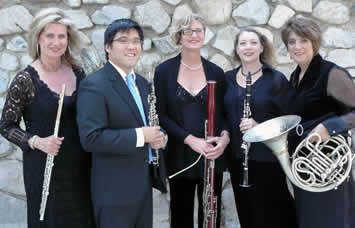 Rachel Rudich, flute; Francisco Castillo, oboe; Linda Sylva, clarinet; Ray Burkhart, trumpet; Carolyn Beck, bassoon. Ray’s “Sierra Suite” now in print. Four movements for organ and brass quintet (2 tpts, horn, tbn, bass trombone or tuba). Commissioned in 1991 by Los Angeles’ Fine Arts Brass Quintet. 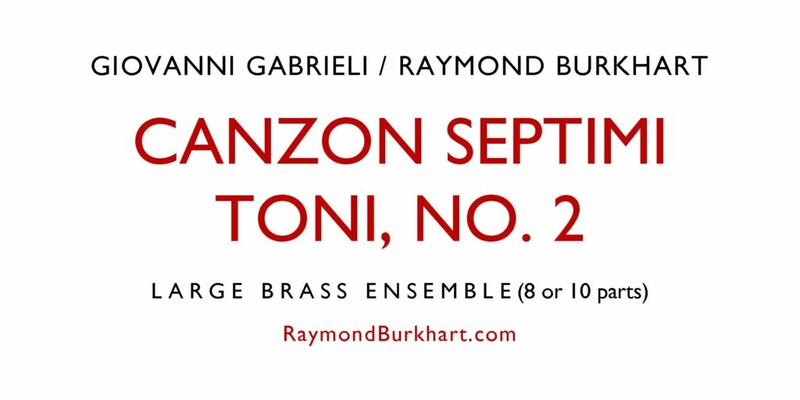 Ray’s setting of Giovanni Gabrieli’s famoius Canzon Septimi Toni No. 2 also now in print. For Eight Brass or Ten Brass. Ray’s “Ricordi d’Italia” and “Two Roman Motets” for brass quintet published. 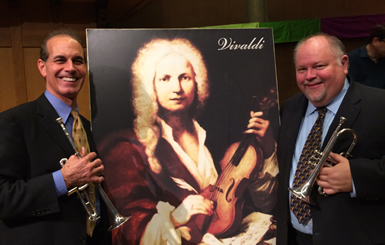 Ray plays Antonio Vivaldi’s Concerto for Two Trumpets with Chris Tedesco and the Enlightenment Music Series. 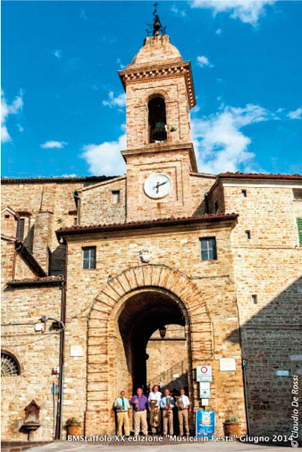 Ray is featured performer, composer, and conductor at the 20th annual music festival held in the historic hill town of Staffolo, Italy. Ray is listed in “Trumpet Greats: A Biographical Dictionary,” compiled and edited by David Hickman, Edward Tarr, and Michel Laplace. The reference book contains biographies of important players, teachers, designers, etc. from the Baroque to the present. Ray’s original work, SERENITY (for solo horn or horn duo), was premiered by Dr. Steven Gross and Julie Callahan Gross on the opening concert of the 5th National Horn Workshop in Kimberley, South Africa. Ray presented his paper, “American Women’s Brass Quartets before 1900: ‘Clever, versatile, and fair to look upon’,” at the Second International Historic Brass Symposium in New York City. Ray is Solo Trumpet for Cinebrass at Sony Pictures (historic MGM Studios) sound stage. 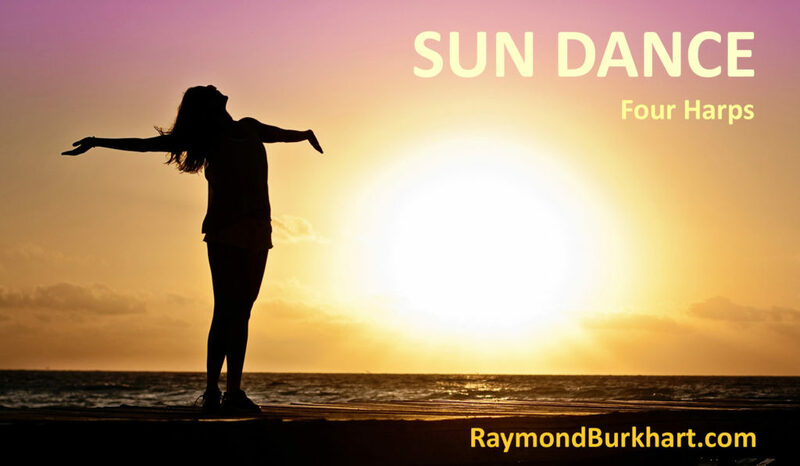 Ray earns his PhD in Musicology from Claremont Graduate University, Claremont, CA. Link to Facebook photo album.